There are currently 34 users and 1537 guests online. 115cm Perth mulla, part of a double hook up but mate pulled the hooks on the other. Cheers, max. Well done on the catch. From what I've learnt from talking to fisheries, other people etc. 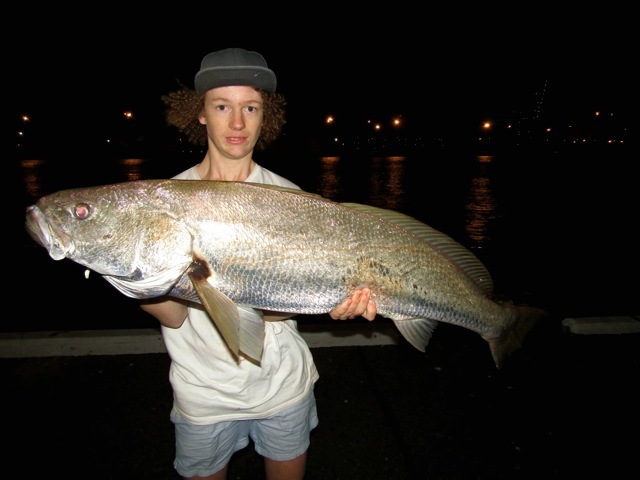 Mulloway release extremely bad, with most tagged fish from the swan washing up on the bank. It was gaffed and gut hooked so kept it, fairly good on the chew and the frame and head are shark bait. Had plenty of donuts before this, realised I had to be fishing the right moon phases, time of day and tides. Since figuring it out between a mate and I we've got two in two trips. I think well handled mulloway out of shallow water release well. I have a mate who has been tagging them from the beach up here for many years, lots of recaptures. And they literally tagged them in the hundreds around the jetty up here last year, 6/0 circles meant there were very few gut hooked. There will always be those who will tell you that released fish "don't survive", just pushing their desire to kill everything they catch. Do you use circles? 8/0 and 9/0 circles are perfect for big mulloway, and have a better hook-up rate than anything else,and, due to mostly hooking in the corner of the mouth, less loss due to teeth wear on leader. Anyway, not judging you, great catch from the metro river. If any depth is involved, totally different story--they just blow up every time, worse than jewies. I run double 6/0 j hooks. fish from the shallows would survive especially if caught on circles. Certainly not going to kill fish after fish, I'll give circles a go next time. Awesome fish to land mate, nothing wrong with keeping a fish . Well done! Awsome fish there and done justice by a great photo to hang in the collection. It's not like you bag out mulloway every trip! Have just come back from Geraldton and it was good to see so many soapies frothing in the marina. And wasn't out to start the whole keep vs return debate. as mentioned the odd one doesn't go too bad on the chew, especially if you are restricted to land based and can't get out demersal fishing off a boat all that often.